Joe Davis serves as a chaplain for the San Diego County Sheriff’s Department at the courthouse in El Cajon since 2003. In this role, Joe serves the entire Medical Examiner staff with the every day stress of dealing with sudden, unexpected and traumatic death. He assists the investigators in the death investigation and often times does the death notification to the family. He is also the Executive Director of the Bereavement Center at the Medical Examiner’s Office, which is only one of four programs like it in the nation that provide free counseling, education, cremation assistance, pastoral care and referrals to families. 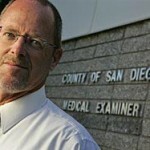 Joe is also the family liaison for the San Diego Eye Bank, the San Diego County Tissue Bank and the U.C. Irvine Brain Research Program. He is also the Executive Director of DUNAMAI Ministries, which facilitates the Bereavement Center program. Joe’s educational background includes a Bachelors of Biblical Ministry from the Horizon Bible Institute and is a Certified Trauma Services Specialist with the Association of Traumatic Stress Specialists. He is also a member of the San Diego County Critical Incident Stress Response team, the American Red Cross Community Crisis Chaplain’s Response team, International Conference of Police Chaplains and an associate pastor for Horizon Christian Fellowship in San Diego. He has lectured for the American Red Cross Spiritual Care Training, the Horizon Bible Institute and the Horizon school of Evangelism. Joe and his wife Bobbie live in Santee, California and have one child, Bill and four grandchildren.